The two musicians/performers Geoff Leigh and Cristiana Vignatelli meet here for the first time to initiate an improvised music performance for flute, voice and electronics. A modern ritual in an imaginative cave, where the music reflects around the space through the austere and totemic circular devices. The public is invited to actively participate in the performance by interacting with the sound mirrors and discovering the subtle sonic reflections they create. Voices of a cavern where Echo and Pan are at play. Cristiana Vignatelli is a visual artist and singer from Rome based in The Hague. As vocalist she has collaborated with jazz and electronic groups as well as being active in the musical improvisation field. As visual artist her research explores the experimental aspects of the processing of matter, always on the brink between formalism and its deconstruction. By introducing a sonic dimension in her works she investigates the link between sound and formal element and how this relationship can strengthen or change the perception of space. 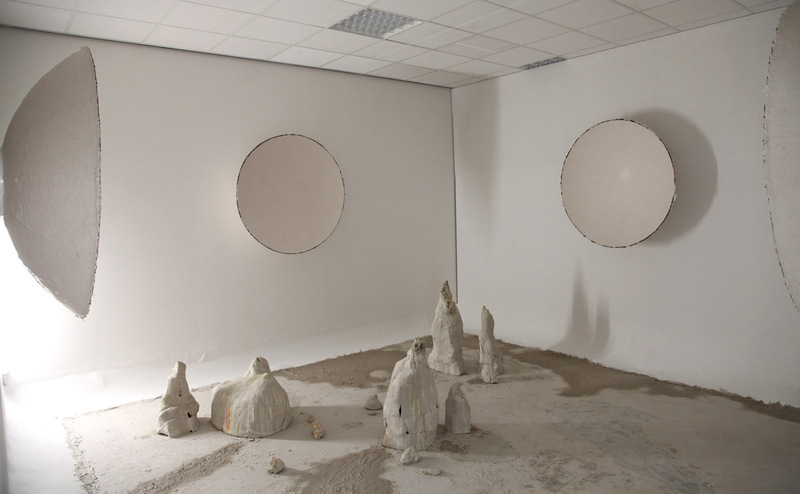 Her sculptural works and sound installations have been presented in museums - National Museum of Modern Art in Rome, Gemeente Museum in The Hague - and in galleries in Italy, Netherlands and South Korea.